Syracuse, NY. Lutheran Church of Atonement. Edgarton & Edgarton, archs (1962). Photo: Samuel Gruber 2014. 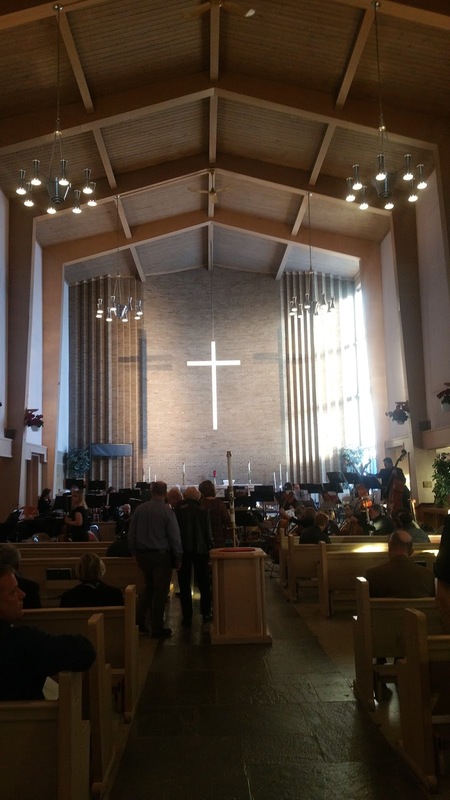 I began this post over a year ago after attending an excellent concert by the Onondaga Civic Orchestra at the Atonement Lutheran Church. It was the first time I'd been in the building and I was impressed by the aura and warmth of the spacious modern interior. 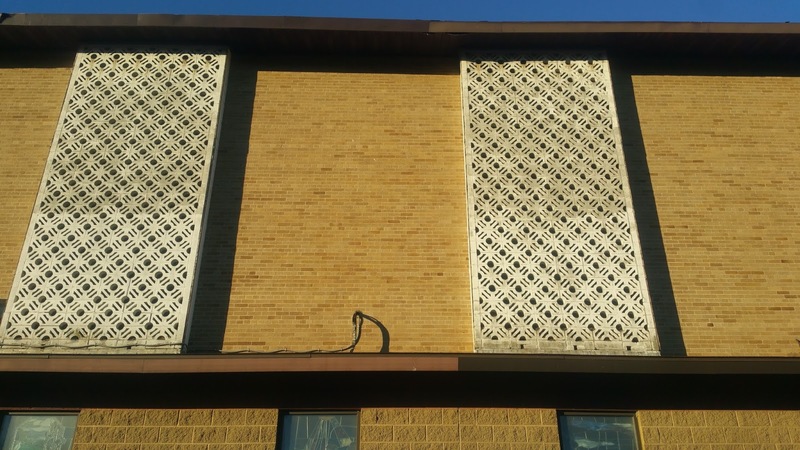 I've previously written about several mid-century modern religious buildings in the region, such as Saint Daniel's Church in Lyncourt. Atonement Lutheran Church is certainly a modern icon on the Southwest side, one of several churches built in the decades after World War II to serve the expanding population and to take advantage of new building technologies and to cater to new modern aesthetic tastes. 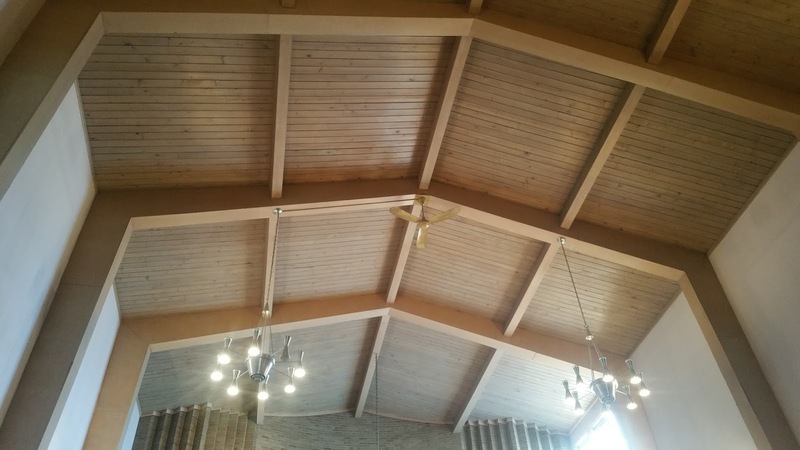 This church was opened in 1962 and designed by the local architecture and engineering firm of Edgarton & Edgarton with input from the Dept. 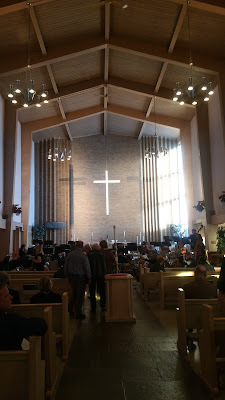 of Church Architects United Lutheran Church in America, and constructed by R. A. Culotti Co. Edgarton and Edgarton are best know locally for the design of the War Memorial of 1952. In 1959 they designed the shopping center (East Syracuse Shopper) at James and West Manlius Streets. Very little is known of the firm. L. Dexter Edgarton was a graduate of Syracuse University and in the 1950s the firm has an office in the Marine Midland Building downtown (if readers know more about the firm please let me know). The Atonement church congregation moved from 1926 Midland Avenue where they had occupied since 1927 a Gothic Revival style parish house and community center designed by Frederick R. Lear. The planned sanctuary had never been built due to the Depression and World War II. The old and new buildings could not be more different. The 1962 structure is a large shed-like building constructed of concrete block and brick on the outside and redwood inside. 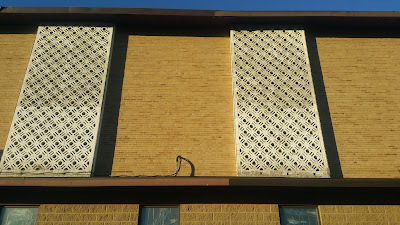 Some of the concrete block is ornamental, used to create decorative screens outside the tall side windows. The most prominent feature is a tower at the entrance surmounted by a large aluminum cross. Inside there are several innovations. The white Georgian marble table-style altar is free standing, said at the time to be the first free-standing altar in the region. This surrounded by a large communion rail which can accommodate more than 40 people. 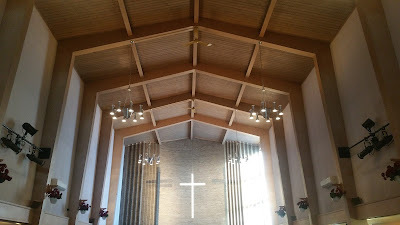 There is little ornament inside the sanctuary, but a large plain white poplar cross is suspended from the ceiling in front of the plain brick eastern wall. The church was dedicated by Rev. Dr. John M. Joslyn, who had already been serving as pastor for five years when the 1928 building was dedicated. Architects Edgarton & Edgarton were already known for their engineering of the impressive 160-foot vault of the War Memorial. 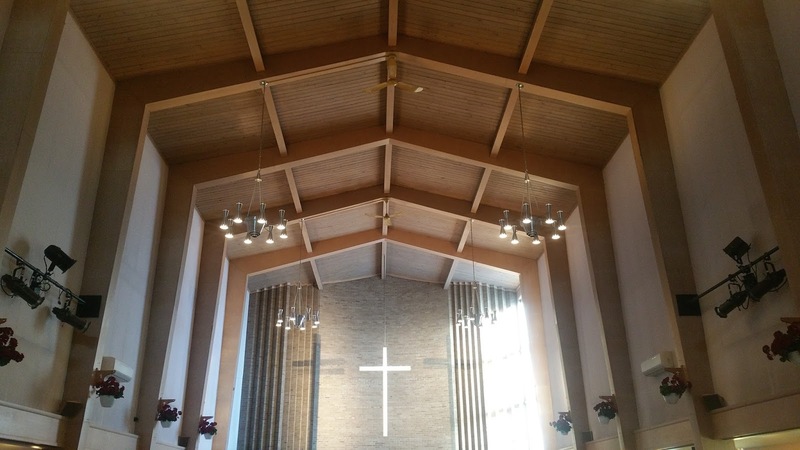 Though the Atonement Church is much smaller, they still attained a sense of vast space with the high wood ceiling raised on wood supports that also buttress the brick walls. The congregation was founded in a church dedicated in 1906 at the southeast corner of Brighton Ave. and Cannon Street, but by the spring of 1926 “the church building was no longer adequate to meet the needs of the enlarged Sunday School and Congregation, and the congregation was authorized by the Board of American Missions of the United Lutheran Church to dispose of the property as soon as possible and to lay plans for the erection of a new Church and Parish House.” In May 1927 the property on West Brighton was sold to the city of Syracuse to be used as a precinct station. On June 19, 1927 ground was broken for the erection of the Parish House and Community Center at the corner of Midland and Brighton Avenues. The cornerstone was laid November 13, 1927 and the building was dedicated in September 1928.